With our legacy of experience and innovation, Cutter Aviation is far more than just a name on a business. The Cutter Aviation team is a group of dedicated individuals who are devoted to serving the aviation community and treating our customers as friends and a part of our family. We are people working together to maintain the quality of the products and services we offer under the Cutter Aviation banner and we are people who care greatly about what we do and how well we do it. The Cutter Aviation philosophy was built on the core values of Trust, Respect and Integrity. They are the guiding principles that placed Cutter Aviation at the forefront of the business & general aviation community since 1928 through today and they will continue to be the words we will continue to grow by for many years to come. We will grow, nurture, and support our people, clients and communities. As a team, we will do so in a professional environment that is challenging, fun, and rewarding. We will be the premier leader and provider of award winning aviation services chosen by customers, employees, and suppliers. 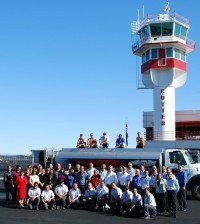 Cutter Aviation considers our customers as our close friends and our employees as a part of our family. To Our Customers: Earn your respect and create lasting friendships by providing the ultimate service experience so that you may enjoy the pleasure of safe flying always. To Our Employees: Cutter Aviation strives to provide a better way of life. We do this by creating an enjoyable and progressive work environment with opportunities to develop personal skills, foster your career growth, and establish and retain financial security for your family. Cutter Aviation is where excellent work is recognized and appreciated always. TRUST – We will always strive to conduct business in a manner to develop a high level of trust from our customers and will do everything in our power to retain that trust. RESPECT – We will respect our customers needs and wishes as if they were our own. We also respect the talent, time, efforts and loyalty of our team members. INTEGRITY – We will conduct business and treat customers in an ethical and fair manner at all times. TRADITION – We will uphold the principles our company was founded upon through future generations. SAFETY – We will create a safe work and operating environment for the benefit of our team and for our customers by maintaining high standards of safety in all businesses. HONESTY – We will uphold honest and fair business practices to gain trust with our customers. FAMILY – We will treat each other as family and as a team — our strength comes from our bond. HEALTH – We will promote the health & well-being of our team members and each other. PROSPERITY – We will provide a workplace and services where both our team and customers may grow and prosper through our help. FRIENDSHIP – We will provide a friendly and positive workplace and pass forward the positive spirit to our customers and friends. FORGIVENESS – We will remain understanding and kind when mistakes are made and grow stronger because of them. PERSONAL GROWTH – We will foster an environment where our team members may grow and succeed and always feel challenged to grow and do more. STEWARDSHIP – We will aim to improve the communities in which we are active and help them grow along with us.